I’ve just bought the Chanel Rouge Coco lippie deal from BuyaPowa which offers a potential saving of 26% – it comes in shade #5 (Mademoiselle) which was the shade I tried when the range was first released. I didn’t love the formula BUT it will make a brilliant Christmas pressie for someone as it comes complete with Chanel gift bag. Alright, so it’s not Chanel for 50p (boo) but you don’t normally get more than 10% off high end brands like that, so it’s a start. I had a few queries about authorising payment when I mentioned the Nails Inc deal… so to clarify, you authorise at the payment level at which you buy. I authorised my Paypal account to release the full price (I was the 2nd to buy) but you will only ever pay the lowest price so if 100 people purchase, you will also benefit from that lowest price point. Clear as mud? Good. Now go get a nice Xmas pressie for your Mum for cheap. P.S. I haven’t been incentivised to post about this – other than the thing where if you partake, I’d be mega-chuffed if you’d click my icon to say you heard it from me. I got a leaderboard beat down on the Nails Inc deal, it was like being picked last for gymnastics ALL OVER AGAIN. I referred you too…so how come you only have 1 referral? What a perfect shade too, so pleased they are listening to us! I got the Nails Inc deal, but also just received a call from paypal verifying the payment and making sure I’d got the goods I paid for! Is there something about the way they take the payment which makes them suspicious? 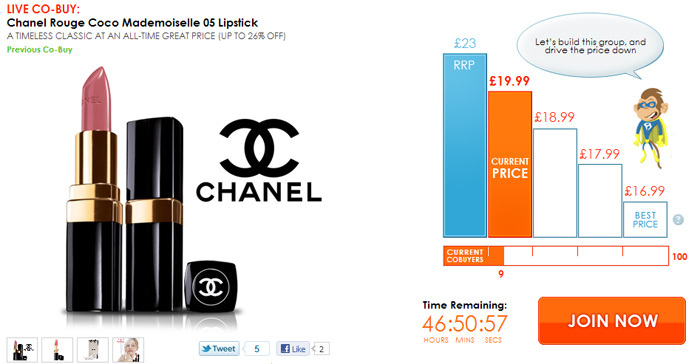 Since when did a Chanel Lipstick cost 31 pounds??!! This is the new RRP Buyapowa have put on the chanel lipstick today. This lipstick costs 23 pounds in Boots (that’s the correct RRP) I also didn’t realise the 2 pounds extra shipping for this item. This is a sure way to lose support very quickly. Hiya Mary, the P&P charge was always there but I have no idea why they’ve hiked the RRP up like that mid-way through the deal, yes – definitely £23 in Boots. If you want to opt out, I think you can email help@buyapowa.com and tell them before the deal closes, just explain why you’re not happy. I’m going to contact about the RRP thing because that’s nonsense and I won’t support silliness like that on my blog. Hopefully it’s a site glitch, I’ll let you know what they say! Hi Charlotte, I just sent them an email about the RRP and shipping cost. As previous co-buys included free shipping, I didn’t see that until after I had purchased the item. It would have been more honest to have the shipping cost on the main page (visible in the same way as the free shipping was previously) rather than ‘hide’ it in the details section. That’s just how I feel. The correct RRP was also up yesterday (a 26% saving, not 42% as advertised now), so it has been mysteriously changed today. I think if they want to establish a network of support, they need to be honest about the retail saving on their items. I also know you won’t support any funny business on your blog! Hi Charlotte, nice that you got a reply, I never received any response from them. I do genuinely believe it was just a glitch, we are a suspicious lot aren’t we! Wanna say a big and sheepish thank you for your referrals, I finished top of the leaderboard. Now, how can we set up a round robin on this so we can take it in turns to benefit from the referral love… any ideas? First to comment gets the love next time or something similar? I noticed the high RRP too but it did revert back to the correct one. I got the Nails Inc deal & was really happy as it arrived very quickly & well packaged. Charlotte – congratulations on topping the leader board! I didn’t want to burst in here without Charlotte’s say-so, but she’s very kindly asked that we pop along to answer a few questions. First, let me apologise for the RRP issue with the Chanel co-buy last week. As suggested above, it was a glitch in the system which we’ve since fixed. I’m really sorry for any confusion caused and promise it won’t happen again. To pick up on a couple of other issues, Naomi the PayPal thing is absolutely normal – somewhat to their credit, they do run spot checks at random from time to time (if only every bank did that!). Mary, you’re absolutely correct about the shipping costs and I’m sorry if they weren’t visible at any point during this co-buy. Although they’re very clear once you click the ‘join’ button, it’s something we also try to include on the *main page* of the co-buy so that everything’s entirely up-front (see our current co-buy for an example: http://www.buyapowa.com/deal/41). Apologies once again for any problems last week but THANK YOU for pointing them out to us and helping us put things right. We’re all about working with people – from co-buy suggestions through to changes we can make to buyapowa.com – so absolutely every comment is always very welcome. I am keeping my beady eye out, I am after sets of things, beauty obvs!